Who doesn’t love a lad who can play the guitar, and who also knows a thing or two about fashion? We know we do. Just like the rest of his band mates, The Vamps‘ lead guitarist James McVey has an amazing style. James was photographed backstage at The Isle of Wight Festival earlier this month. We think his outfit was very fashion forward, and therefore we’ve compiled an outfit consisting of all the pieces you need to recreate the lead guitarist’s cool and casual look. 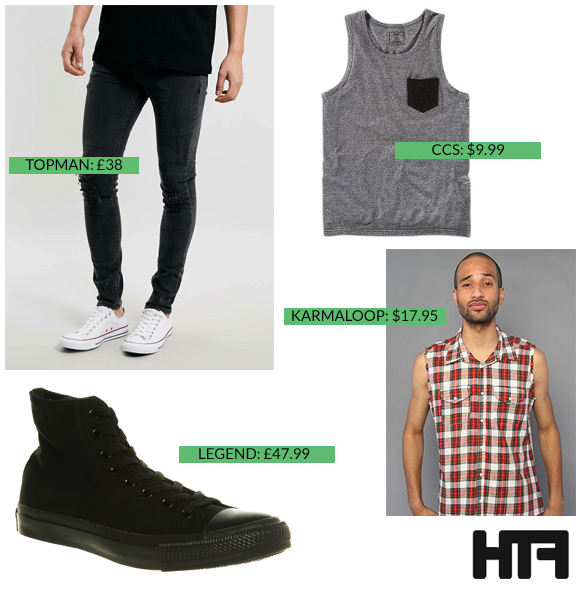 Imitate James’ look by teaming a pair of black ripped jeans from Topman with a simple plain grey tank top. We found a similar one from CCS, which is currently being sold for around £6.00. To give an edge to his outfit, James also wore a plaid sleevless shirt. This particular shirt from Karmaloop is nearly identical to the one James wore. The lead guitarist finished off his look by wearing a pair of black converse, which are being sold for £47.99 from Legend Footwear. Primary Teacher by day and Fashion Writer by night, I'm an aspiring fashion photographer who is addicted to shoes and wants to travel the world.